Earlier this week, Warren Buffett shared an excerpt from the forthcoming Berkshire Hathaway shareholder letter, which sent investing geeks like me poring over every word. It's all well worth a read, as you might expect, but here are my favorite quotes. I'll let them speak for themselves and provide some commentary at the end. "I needed no unusual knowledge or intelligence to conclude that the investment had no downside and potentially had substantial upside." "You don't need to be an expert in order to achieve satisfactory investment returns. But if you aren't, you must recognize your limitations and follow a course certain to work reasonably well." 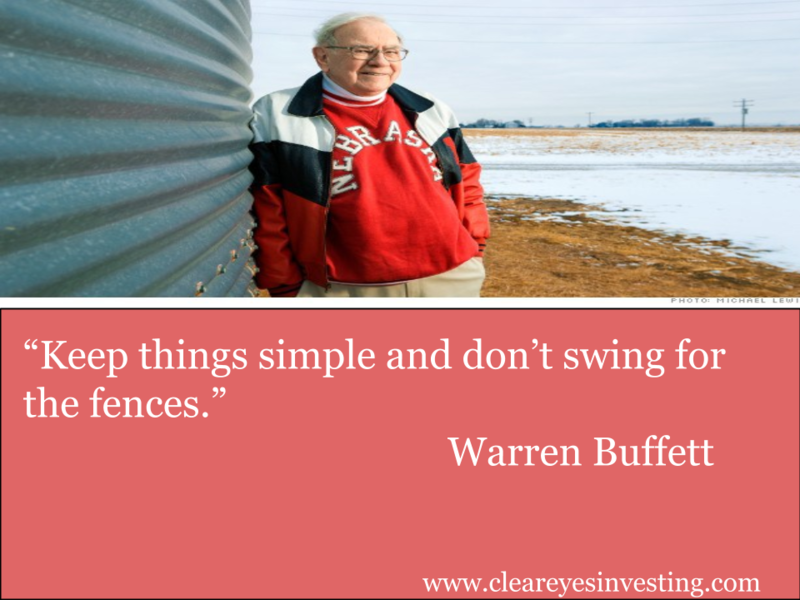 "Keep things simple and don't swing for the fences." "When promised quick profits, respond with a quick 'no.'" "If you don't feel comfortable making a rough estimate of the asset's future earnings, just forget it and move on. No one has the ability to evaluate every investment possibility." "Games are won by players who focus on the playing field -- not by those whose eyes are glued to the scoreboard." "Forming macro opinions or listening to the macro or market predictions of others is a waste of time." "It should be an enormous advantage for investors in stocks to have those wildly fluctuating valuations placed on their holdings -- and for some investors, it is." "Owners of stocks...too often let the capricious and irrational behavior of their fellow owners cause them to behave irrationally as well." "In the 54 years (Charlie Munger and I) have worked together, we have never forgone an attractive purchase because of the macro or political environment, or the views of other people. In fact, these subjects never come up when we make decisions." "We recognize the perimeter of our 'circle of competence' and stay well inside of it." "The goal of the nonprofessional should not be to pick winners...but should rather be to own a cross section of businesses that in aggregate are bound to do well. A low-cost S&P 500 index fund will achieve this goal." "The antidote to (buying when the market is high) is for an investor to accumulate shares over a long period and never sell when the news is bad and stocks are well off their highs." "The unsophisticated investor who is realistic about his shortcomings is likely to obtain better long-term results than the knowledgeable professional who is blind to even a single weakness." "The resulting frictional costs (from advice and trading) can be huge and, for investors in the aggregate, devoid of benefit." "So ignore the chatter, keep your costs minimal, and invest in stocks as you would a farm." "Before reading (The Intelligent Investor)...I tried my hand at charting and using market indicia to predict stock moments...I listened to commentators. All of this was fun, but I couldn't shake the feeling that I wasn't getting anywhere." Buffett's commentary is broadly consistent with the purpose of this blog -- specifically, using patience and long-term thinking to your advantage, not letting Mr. Market's mood swings influence your decisions, and investing when the odds are in your favor. It all seems so obvious, doesn't it? As we've discussed before, successful investing might be simple, but it's not easy. Patience, calmness, and selectivity are all ideals that we strive for yet we frequently find overselves coming up short, often getting caught up in market noise or falling into a trap of overconfidence. Buffett's periodic letters, if anything, remind us where the North Star of investing lies and challenge us to seek simplicity. If I have one critique of the letter, it's that Buffett -- who's fully aware that everything he writes will be read for generations to come -- appears to be putting less emphasis on individual security selection and more on index funds at this stage in his career. Interestingly, Ben Graham also changed his tune regarding security selection toward the end of his career in 1976. I am no longer an advocate of elaborate techniques of security analysis in order to find superior value opportunities. This was a rewarding activity, say, 40 years ago, when our textbook "Graham and Dodd" was first published; but the situation has changed a great deal since then...To that very limited extent I'm on the side of the "efficient market" school of thought now generally accepted by the professors. Similarly, Buffett states in this letter that "the goal of the nonprofessional should not be to pick winners -- neither he nor his 'helpers' (i.e. investment professionals) can do that," and concludes that a low-cost S&P 500 index fund is a better option. These comments seem to be a departure from his stance in The Superinvestors of Graham & Doddsville (1984) in which he gives examples of value-oriented investors that have consistently outperformed the market and whose track records run contrary to the efficient market hypothesis. Is the Graham and Dodd "look for values with a significant margin of safety relative to to prices" approach to security analysis out of date?...Well, maybe. But I want to present to you a group of investors who have, year in and year out, beaten the Standard & Poor's 500 stock index. Don't get me wrong -- I'm an advocate of index funds (indeed, I own a few in my own portfolio) and think that the financial services industry deserves a fair amount of criticism for high fees and underperformance. Still, I think there remain plenty of opportunities for superior stock selection in today's market. Stock picking opportunities didn't disappear after Graham's comments in 1976 and they won't disappear now. Has It Come to This Again?